We've had quite a few posts on this subject before, from scrounging pallet wood for construction (which can be found at almost every turn), to dumpster-diving for materials, and finding/collecting them streetside (esp. 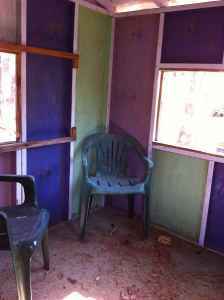 windows and doors on daily trash routes/construction site debris piles).....but Craigslist is the one often used and obvious place we have not discussed quite as much- at least in terms of pure salvage. You'd be amazed, in YOUR area (well, unless you're in the middle of nowhere Montana, etc) at what pops up under the search title "Free"- lumber, appliances, boats, campers, defunct mafia torture tools, and more- and alot of it is perfectly good stuff- you just need to ask a few questions, and check out the photos first, before hoppin' in you car for the trek. Today's Example: Now here's a free 8' by 8' by 8' clubhouse (or guesthouse? if you tweaked it) that was recently up for "FREE" in my area just last week- it also came with the offer of an enormous swingset worth of pressure treated lumber (none of it that old)- so, with some time and a few simple tools, you'd have this free shack AND an abundance of lumber all in one trip with a smallish trailer or truck. 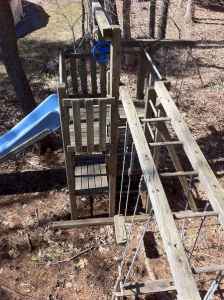 Beyond that, if you want more bang for your buck, and have no kids, or no need for a swingset, with a little research you'll find that the slide itself (and various other swings and parts) are actually quite pricey as replacements. 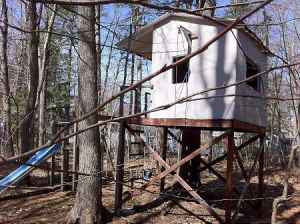 Therefore, there is a used market for these items on craigslist and ebay- making your trip even more potentially worthwhile....AND, potentially providing even the most "broke" of us with a means to acquire additional funds for that dream micro-cabin in the woods. Heck, in this case, the 8-foot-cabin cabin COULD already be that tiny dream cabin, writer's retreat, or treehome/treehouse escape- it just needs some rennovating and t.l.c. As for the gas money to get to these free items- well, that's where selling some of this stuff on the side not only covers that and evens things out, but brings you out far ahead in the end of this often fun and rewarding game. Also, after doing this for awhile, you may end up with an excess of perfectly useable lumber. If that starts taking up too much room next to your front-yard collection of garden gnomes, then there's also the cash possibility of moving THAT as well.